Patrick Chun, who worked for the past 20 years at Ohio State and Florida Atlantic universities, takes over as WSU’s athletic director Feb. 5. Nearly four months later, Patrick Chun, a 43-year-old Ohioan of South Korean ancestry, is taking on the job of erasing as much of that debt, most of it spent on facilities upgrades and coaching salaries, as he can. WSU’s new athletic director, who comes to Pullman from Florida Atlantic University, will be paid $650,000 a year, plus incentives tied to successful fundraising efforts to make the red ink go away. WSU President Kirk Schulz formally introduced Chun Tuesday during a Pullman press conference that was delayed a week due to the death by suicide of Tyler Hilinski, who had been the favorite to become the starting quarterback next fall. 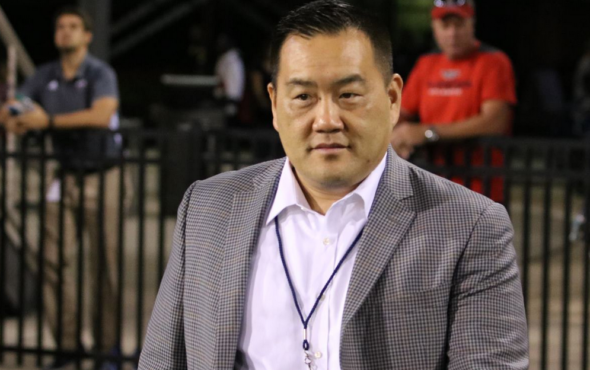 The first Asian-American athletic director at a Power 5 conference school, Chun will officially start Feb. 5 after he relocates from Florida Atlantic, where he spent the past five years as athletic director. He is officially WSU’s 14th athletics director. Chun’s most visible move at Florida Atlantic was the hiring of football coach Lane Kiffin a year ago. Kiffin turned a 3-9 program to an 11-3 one that has led to a significant increase in contributions to the school’s athletic fund. More significant to WSU officials: Two years ago, Chun landed a $16 million donation to FAU’s athletic department, the largest single gift in school history. He also landed two more at $5 million each. All three are much larger than the largest gift to WSU, which came in 2011 — $3 million spread over 10 years. Chun also headed up the procurement of donations to help fund an academic center, a tennis complex, the construction of sand volleyball courts, and the renovation of FAU’s soccer field. Prior to his half-decade at Florida Atlantic, Chun spent 15 years (1997-2012) at his alma mater, Ohio State, where he was promoted a half dozen times before his departure to Florida Atlantic. Among other things, he helped land the largest multimedia rights deal in intercollegiate athletics history at the time: A 10-year, $128 million deal with IMG College in 2009. Prior to that, Chun orchestrated fundraising efforts that led to Ohio State completing a $21 million football facility renovation. He also raised money for a $5.1 million softball stadium project, a $3 million boathouse and a $3.3 million indoor tennis facility. Working in Ohio State’s external relations arm, Chun oversaw record fundraising years with $42 million in 2012, $41 million in 2011, and $39 million in 2010, according to school records. “Fundraising is all about people and passion,” Chun said Tuesday. “We’re going to go out and meet people and make them understand the great things that are happening at Washington State and ask them to help us. We are confident Cougar Nation will. We are going to strive to be the best in the country in everything we do. Among Chun’s first tasks: taking over fundraising efforts to build an indoor practice facility. They hired a proven fundraiser– good. They hired the man who hired Lane Kiffin– awful. Kiffin is just a warm up for Mike Leach.